Merry Christmas! Wish you a wonderful holiday and a properous New Year! What did Dr. Oz say about vitamin supplement? 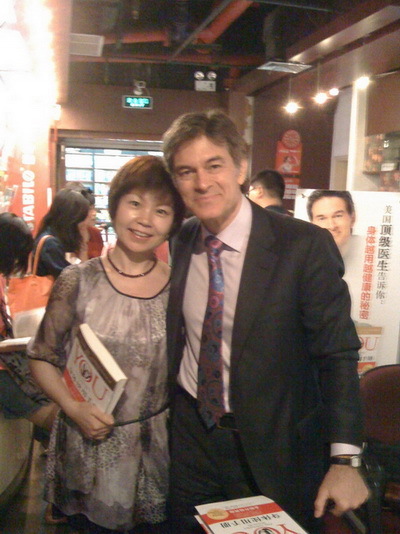 Dr. Oz visited Shanghai in July. I was lucky to have an opportunity to ask him a question. "Are vitamin supplements necessary? " He answered: " The best nutrient we should take is from food. We take vitamin only when we have a health problem. " ABC made a survey that 80% Americans take vitamin pills. In fact many of them don't need to. We should live on fresh food but not pills. In last issue, we talked about cause of disease in view of TCM. Six climatic pathogenic factors, or six exogenous Qi, or six evils are spring-wind, winter-cold, summer-heat, later summer-dampness, autumn dryness, summer-heat (fire). Usually, people can adapt the climatic changes. But when your health Qi is too weak to resist the changes you'll be attacked by them. The six exogenous Qi enter the body through surface of skin, mouth and nose. Six evils are related to seasons. For instance, the common cold caused by winter coldness or early spring wind-cold; the diarrhea caused by summer damp-heat, etc. Six evils are related to working or living environment. People living in tropical zone tend to be attacked by heat and damp evil such as Singaporean. However, because of the widely use of air conditioner, more Singaporeans are attacked by cold-related diseases now. More or less we can't resist the temptation of gourmet, especially in holiday when being together with friends and families. It's easy to feel stuffy or greasy. Besides controlling your appetite you can eat some scraping-oil foods. They are teas, corns, eggplant, hawthorn, etc. Many fresh vegetables also help to remove fat such as celery, cucumber, white radish, etc. If you have a big meal the previous day you should prepare scraping-oil meal the second day, or next meal. Puer Tea works best among the teas. It especially remove the fat in the abdomen. But remember, you should use pure tea without any sugar and other ingredients added. Take a bag (or a pinch(2-3g)) of puer tea, put in a cup, add boiling water. Cover, brew for 5mins. Drink one hour after a meal. Eggplant and corn are a couple. Of course you can serve separately. uncomfortable in your stomach. But when serving with eggplant you can solve the problem. eggplant it can enhance the function of scraping oil. The best cooking method is to boil corn and steam eggplant. Put corn on the cob in a pot. Add water covering the corn. Boiling for 30-40mins. Clean eggplant, split 2 or 3 parts, place on the tray of a steamer. Steam for 10mins or when you can stab in easily by chopstick or a fork. Mix with sesame oil (or olive oil), vinegar and salt, stir evenly, serve with corn. boil it and serve with a little cristal sugar. White radish helps to digest, remove phleghm, and smooth Qi. When you have a food stagnation, vomit, or cough, you can try some white radish. White radish usually is served in soup, stewed dishes. Radish Beef Soup and Stewed Radish Beef are common radish dishes. When served for digestion purpose, raw radish is more effective. Cut into thin flakes, serve 3 to 4 flakes after meal, especially after dinner. It's simple and easy. a. Massage your abdomen in circles. Lie down flat. Relax. Place your right palm on the belly button with left hand on the right hand. Take belly button as the center. Circle your hands slowly clockwise 30 times. From smaller circles to bigger ones. Repeat counter-clockwise 30 times. From bigger circles to smaller ones. This can be done after meals or any time you feel food stagnated. Massage your cheek slightly by hands after meals. This will promote the secretion of digestive enzyme. ZuSanLi is one of the point of the stomach meridians. It is used in therapy of poor appetite, nausea, vomiting, diarrhea, dizziness, insomnia, and fatigue. Press or beat slightly by fist ZuSanLi will increase digestion. Below the knee, there is a dent on the lateral of pattella. From that dent point, about three inches,( or about 4 finger widths). One finger breadth (middle finger)from the anterior crest of the tibia. See below picture. I'm sorry that I didn't write the newsletter for several months as I've been writing my another website. I found that only one or two recipes give too little help in dieting. So I decided to setup another website about whole eating plan. That's Ibestdiet.com. Please take a look and give some advices. It's still in updating.